Grab your hoverboard and take to the skies in the futuristic super-speed air racing of TrickStyle. There's no need for wheels here as you choose your stylish racer and board and head for the Velodrome. At the Velodrome staging area you enter a room and decide which of the 18 tracks you'd like to strut your airborne stuff on. Race on three continents on awesome tracks that will challenge your every reflex and skill. But wait, there's no time to rest as you face off against a champion boss character. Emerge victorious and you'll unlock brand new hoverboards to compete with. Pull off wild tricks, spins, and jaw-dropping jumps while blazing across inventive courses. Slip between narrow passageways, avoid buildings, dive under bridges, and hop over fences as you blitz towards the finish. 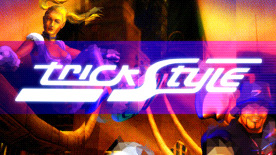 TrickStyle includes an iconic techno soundtrack, and inspired sound effects.